Indy is an in-game artifact catalogue born out of necessity and a lack of artifact APIs. Create a macro "AddArtifact" with text "indy additem"
Create a macro "DelArtifact" with text "indy deleteitem"
Mouseover any artifacts you have collected and while the tooltip is displayed, hit the AddArtifact macro to record that the item has been collected by the current character. If you make a mistake, mouseover the item and hit the DelArtifact macro to remove the item from that characters collected list. Use /indy checkbags to see if there are any artifacts in your bags that are needed by your alts. Toggle auction house scanning with /indy scanah and page through the Misc -> Collectible category to report if there are any artifacts that you are looking for up for sale. This feature currently does not support the Full AH Scans provided by some AH addons. - Bumped version to 1.2.0 for release. - Improvements to performance when handling big auction house queries. - Bumped version to 1.1.16 and environment to 4.0. - Updated version to 1.1.14 for release. - Added duplicate checking for missing artifacts in the event they start appearing in the Discovery log. - Updated artifact collections with 2015 Fae Yule sets. - Bumped version to 1.1.13 for release. - Use item details cache for queries with tables of items. - Fix /scanAH help text. - Fix for WhoNeedsItem attempt to compare number with nil. - Updated version to 1.1.12 for release. - Fix for idLookup is nil. - Updated version to 1.1.11 for release. - Construct cache of sets by itemId so that we do not repeatedly iterate through INDY_ArtifactCollections. - Fix calls to InspectItemDetail. - Remove debugging print statements. - Created item cache to reduce number of repeated server queries. - Added missing Nightmare set. - Renamed UnstableArtifactCollections.lua to MissingArtifactCollections.lua. - Updated to version 1.1.10. - Updated environment to 3.4. - Added option to move bag scan button since Docker is AWOL. - Refreshed ArtifactCollections.lua with 2015-11-02 official discovery zip snapshot artifact data. - Updated to version 1.1.9-4. - Updated environment to 3.3. - Refreshed ArtifactCollections.lua with 2015-09-11 official discovery zip snapshot artifact data. - Fix crash when mousing over resource nodes. 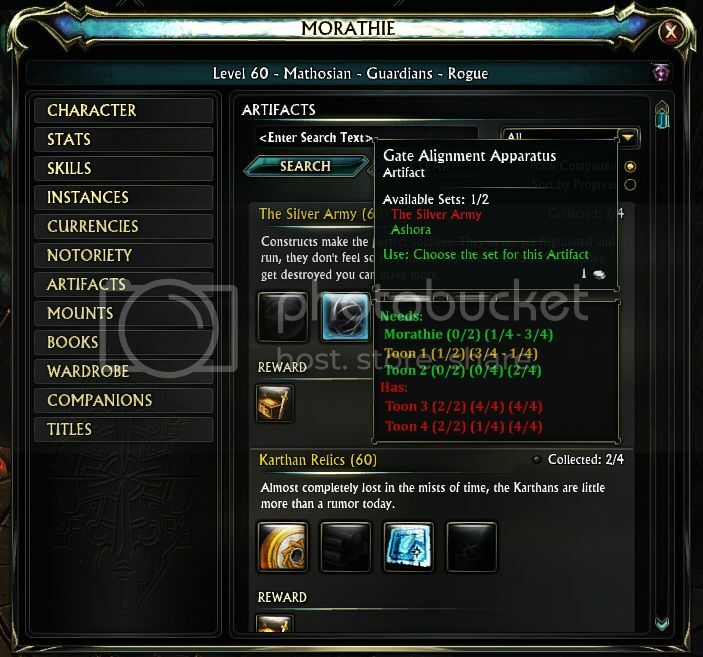 - Fix for patch 2.6 Hotfix 7 artifact category changes and tooltip item ID changes. - Bumped version to 1.16 for release. - Improve performance of OnBagEvent. - Update LibSimpleWidgets to 1.14.1. - Migrate data from artifact ids which have been changed. 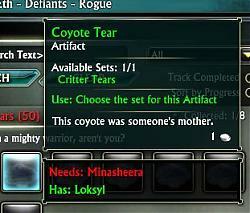 - Update artifact sets with RiftDiscoveries.xml 20140221. - Move strsplit and strtrim functions into the private namespace so they can be accessed from any file. - Rename UpdateArtifactIds to AddNewArtifacts. - Add new Unstable artifact sets. - Add function to update profile artifact id table with any new additions to INDY_ArtifactCollections. - Updated with latest artifact set information. - Repackage to fix weirdness. - Added option to display single character per line. - Allow user configurable colors in tooltip. - Fix for InspectTooltip returning a nil. - Potential fix for "too much CPU usage" error when checking bags for artifacts. - Bumped toc to 1.1.0 for major feature release. - Configuration window now tracks state if option was toggled using slashcommands. - Fix for artifact tooltip remaining visible after moving away from item. - Moved Toggled functions to config file. - Added option to toggle display of verbose tooltips. - Added function to convert artifactTable to new format. - Fix to display artifacts which have no sell price. - Cleaned up some globals that should have been locals. - Fix for "index field category = nil" error. - Replaced square left right buttons with rift themed 3 state buttons. - Improved tooltip display. Now in glorious Technicolor (TM)! Go here to download Indiana with shard tracking. Instructions are provided to help manually migrate your data to the new format and servers, but if you choose not to follow them you will have to re-catalogue everything. I'd be cool with that. I'm not concerned with having to set it up again (wouldn't be the first time LOL). I was wondering too why that seemed to be one of only like 2 addons I have that weren't already setup like that. Seems like it wouldn't be hard to just copy the existing saved folder from your current/previous shard folder to the new one and then rename it if you had to rename your character. Also, with it's current setup, if I had my toon "PlayerA" who got affected by server merge and had to be renamed to "PlayerV" would it track that change or would "PlayerV" be seen as a new character and thusly have to have it's collected artifacts re-cataloged? 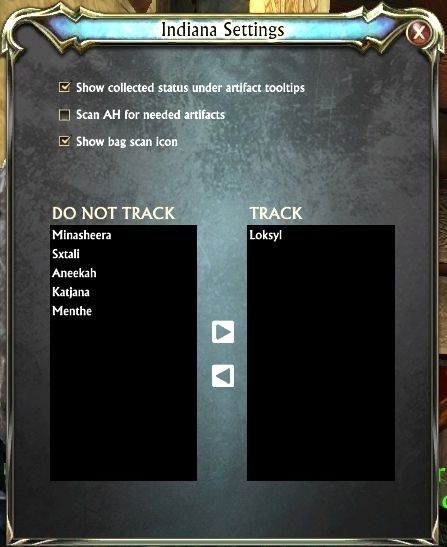 Is there way to make it not track characters that are on different servers? I don't want to not track them at all nor could I if I wanted to since I tend to use the same names on different shards. I'm afraid not. There was reason why I set it up that way but I forget what exactly. Probably because server merges and transfers were rife at the time and would require setting up your catalogue from scratch every time you switched. That said it should be fairly simple to add a patch to do it, although you would lose your existing data since it would not be backwards compatible. However, it's not something I would want to change in the main release. Last edited by Elaani : 12-18-13 at 01:54 AM. Please try re-downloading the package. I have published a repackaged version. That did the trick. Thanks. Thanks for the update, but for some reason, it's not showing up in the game. I placed the folder in the addon folder, like always, but there are no tooltips nor is it even showing up in the "Addons" window in the game. I would also like to see as shown in pic (if possible), an artifact collection amount. Shown 2 ways, top 2 would be preferred. Morathie has 0/2 of this artifact but needs it to complete one of the sets. Toon 1 has 1/2 of this artifact but needs it to complete one of the sets. This way I can see who needs it more, weather its Morathie or Toon 1. I don't want to have to jump in and out of 3 toons to see that 2 toons are 3/4. While I would love to have this feature, there is no API to check how complete an artifact set is. Yes I photo shopped that So there was a visual to what I was asking about. But I did see that you seemed to have almost all of them sorted in an LUA file (some still read 0/??) 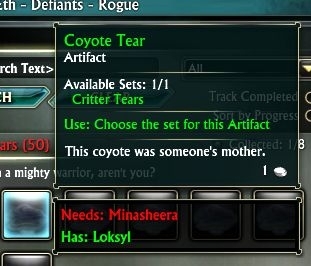 thought there might be a way to reference that collection list against the tooltip one, to do the job. As for the other color, not required just a nice addition to make it stand out quick. Last edited by Morathie : 10-20-13 at 12:40 PM. Re: Option to change colors? First off, let me say that I love this addon. It's slowly making life alot easier. However, I'd love to see the option to change colors in the tooltips. Should I still need to collect an artifact that I find, the in-game tooltip is in green (Artifact set name) whereas your tooltip is red (Needs). It's a little confusing at first glance. It'd be great if they shared the same color scheme. As person stated below, I too want the colors to match in game ones. I changed this my self Shown in code below is some one wants to change as well. So I have added options for user-configurable tooltip colors and displaying one character per line. I did not add an option for the partially acquired sets yet, because I would like to understand where you are coming from. My reason for only having 2 colors was that you either need the artifact or you do not. i.e. you either have the artifact in all sets or you do not have it in one or more sets. What does the third color tell you that the existing two colors do not? Last edited by lokyst : 10-20-13 at 08:54 AM. I also like your additional ideas and would love to see them added too. ps. I made it show on separate lines as shown in pic, as I find this more readable for me. I am not very good at Lua code let allow my limited coding in rift. But if some one wants too do this to theres, open the file "Indiana\tooltip.lua" I added \n in the code, code below is right near top of page, the extra space after \n, just sets it off the side of the page a bit, if you want more space just add more spaces . Last edited by wrink : 10-12-13 at 10:50 PM. This should be fixed in version 1.1.2.
when I use /indy additem macros. Last edited by Undo : 03-02-13 at 07:28 AM.